This is my very first GTK+ program. It is a port of a BBC-BASIC program, i have done one day on a Acorn RiscPC. 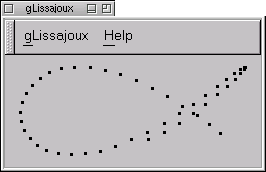 The program calculates an simple animation of lissajous-figures. These are the figures you can see on an oszilloscope, when you drive the x and y inputs of the oscilloscope with different sinus voltages. The frequency for each sinus wave will be chosen randomly on the start of every round and the amplitude will get altered slowly from 0 to 1 and back. 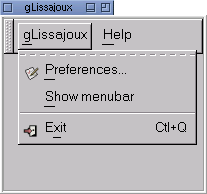 Originally there were a separate gnome and gtk only version, but in the latest release, i've merged both to glissajoux-2.0.1.